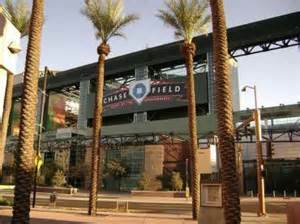 Chase Field, formerly known as Bank One Ballpark, is located in Phoenix Arizona, and is the home of the Arizona Diamondbacks who play in the Western Division of the MLB National League. 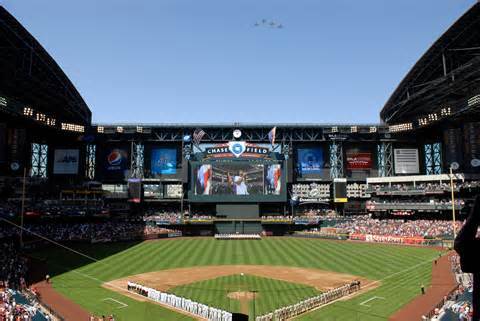 In order to compete for a major league baseball expansion franchise, the Maricopa County Board of Supervisors authorized the levy of a quarter-cent tax increase to pay for the construction of a stadium. This came at a time when the county was experiencing extreme financial difficulties and was cutting public services, which enraged the citizens making the stadium tax extremely unpopular. So unpopular that in May 1997, Maricopa County Supervisor, Mary Rose Wilcox, was shot while exiting a county board meeting, by Larry Naman, a homeless person, who claimed he was right in trying to kill her because of the tax. Naman was convicted of attempted first degree murder in May 1998. Ground was broken in November 1995 and the ball park was barely completed in time for the Diamondbacks opening season of 1998 due to construction issues with the retractable roof. 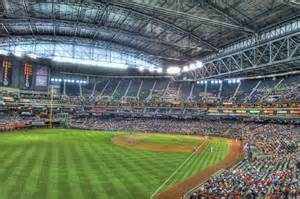 Chase Field became the First stadium in the United States, there were two in Canada, Rogers Centre and Olympic stadium, to have a retractable roof with a natural grass playing surface. Closing of the roof is a decision based on the local weather conditions 3 hours prior to game time and once the decision is made to close the roof the monstrous HVAC system drops the temperature inside the park 30 degrees. The original HVAC system was not large enough to cool any seats above row 25 of the upper deck, which exposed fans to extreme heat of the outside temperature and the increased heat of the sun coming through the glass roof panels. This has since been corrected and the entire facility is able to be cooled. Chase Field has a luxury Suite, sponsored by Ridenow Powersports, located in right-center field, which has a swimming pool, and is rented to patrons, no more than 35 guests, for $3500 per game. Mark Grace was the first player to hit a home run which landed in the swimming pool. The playing field is natural grass and dirt. Chase is one of only two parks, Comercia in Detroit, which has a dirt strip extending from home plate to the pitching mound. This dirt strip, sometimes referred to the “Keyhole,” was popular in original older stadiums, but fell out of favor in modern times. The facility offers an adequate amount of concession areas and other eateries, offering traditional baseball food of hot dogs and popcorn to steak dinners.